The GDC expect the dental team to follow the guidance on medical emergencies and training updates issued by the Resuscitation Council UK. This series of modules have been developed based on their updated 2015 guidelines. 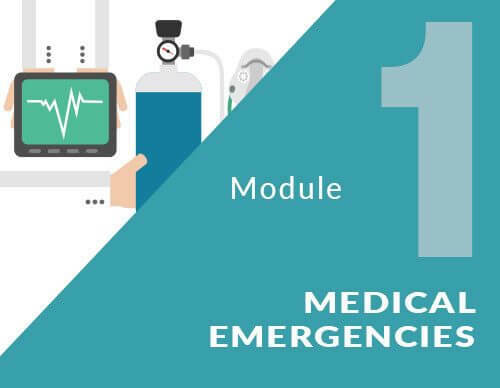 Medical emergencies is a GDC recommended subject for continuing professional development. This is the first module in a series of four modules. The GDC requires dental professionals to link their CPD activities to at least one development outcome as part of the new enhanced CPD scheme. This module can be linked to development outcome C: Maintenance and development of knowledge and skill within your field of practice. Suitable CPD for all members of the dental team. Completion of this module and passing the associated quiz will satisfy GDC requirements for 1.5 hours of CPD in medical emergencies. The content does not have to be completed all at once, you will be returned to where you left off when your restart the e-learning module. Outline the basic principles for managing an emergency as a team. There are interactive questions and activities throughout the module which are not assessed. On completion of the module there is a separately assessed quiz. You will need to achieve 70 % for this quiz to complete the module and access your CPD certificate. You will have two opportunities to achieve the required score.